Every opera you’ve ever heard, every painting you’ve ever admired is reducible to chemical signaling in the composer’s or artist’s brain. We can map where in those brains the work got done: some in the occipital, where imagery lives; some in the insula, which feels emotion. It isn’t beauty; it’s biology. That, at least, is one way to think of it. The other, lovelier way is the one we prefer. Creativity is that ineffable match-strike, that flash in the dark that comes to you from, well, it’s hard to say where. You can’t summon it on demand, though inclining your mind to a task does help. You can’t choose your creative silo either: The musician is not an architect; the painter is not a poet. And not all creativity is artistic: there’s the genius of the industrialist, the mathematician, the surgeon. America grew not just because of its industrial base but also thanks to its inventors and thinkers: Thomas Edison, Jonas Salk, Steve Jobs. Our future lies that way too. 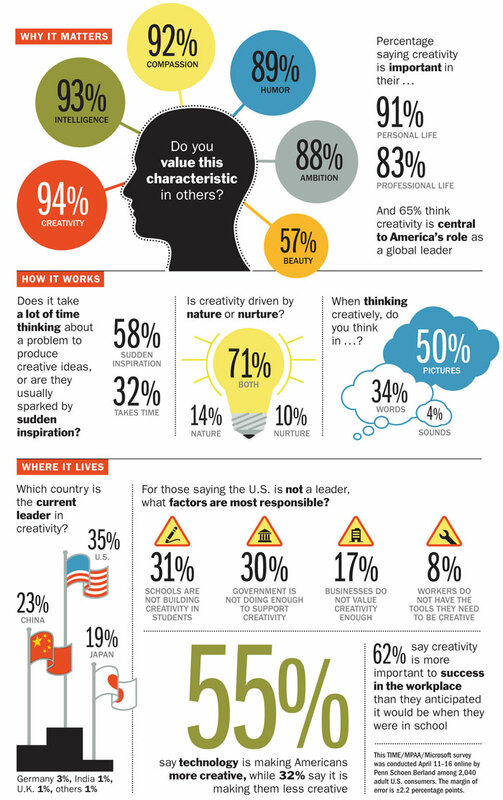 Working with the Motion Picture Association of America and Microsoft, TIME polled Americans about creativity in the workplace, schools and government. Does the U.S. still have the juice to be a global leader in innovation? Is our creativity being harnessed at work? The results are encouraging—and not. Creativity is a renewable resource, one that’s universally, if not evenly, distributed. We don’t decide how much we get, but it’s up to each of us—and the nation as a whole—to tap what’s there.